I’ve seen an argument being made in the past week: that the iPad mini is for “consumption”, whereas the iPad Air is for “creation”. This idea has been reinforced by Apple’s announcements: with both iPads now carrying the same hardware, the difference between the mini and the Air comes down to the fact that one is for consuming media and the other for creating content. I disagree. The 7.9-inch screen has allowed me to use the iPad mini in portrait mode far more often than I used to on a 9.7-inch iPad. Thanks to the smaller screen, I can quickly thumb-type with the portrait keyboard – an important aspect of my iPad experience that has made composing emails and publishing linked posts on the site much easier. Because I don’t have to switch from holding my iPad in “reading position” to placing it on my lap with a Smart Cover, I can move between apps and keep writing without adjusting myself to the iPad. To paraphrase the promo video of the original iPad from 2010, the iPad mini fits me better. That was impossible with the larger iPad: I couldn’t type in portrait mode, the device was heavy, and I was constantly switching between portrait reading and landscape typing. The iPad mini is so light, my girlfriend doesn’t mind putting it in her bag when we’re going out of town or on other occasions. In general, the iPad mini’s lightness resulted in having it available for work far more often than the old iPad, which was too large and bulky for a woman handbag. Thanks to the built-in 3G, I’ve worked from my iPad mini in coffee shops, at the beach, and, one time, I even published a news article to MacStories while my mom was driving me back from the hospital. The portability of the iPad mini is excellent. My anecdotal experience doesn’t tell the whole story. I’ve met students who opted for the iPad mini because of its lighter design and “large enough” screen that, unlike Android tablets, allows them to take notes during class, create spreadsheets at home, and read comfortably on the bus. I’ve seen store managers using iPad minis to showcase products to customers holding the device for several minutes with one hand, interacting with graphics on screen with the other. I’ve talked to parents who said their children preferred the iPad mini for educational apps and games because it was lighter and more compact. Take a look at Apple’s website for the iPad mini and iPad Air. Apple never implies that the iPad mini is better for consumption than creation. The webpages are nearly identical – both have a focus on work and play with a desktop-class architecture thanks to the A7 chip, and that’s it. I believe that the argument about the iPad mini being better at content consumption has been largely made up by people who never actually used the iPad mini for work – or at all. Of course, like any other device, its design comes with trade-offs: the keyboard is smaller than the iPad Air in landscape mode; the first-generation model didn’t have a Retina display; and, in general, touch targets and documents are smaller than the full-size iPad. But these weaknesses have, in my opinion, far stronger positive aspects on the flip side: the iPad mini is more comfortable to hold and type on, especially in portrait mode; its lightness is still unparalleled; the 7.9-inch screen is small enough for bags but big enough for reading and typing. With the second-generation iPad mini, Apple is adding a Retina display and the 64-bit A7 CPU to the device while effectively keeping the same weight, battery life, and overall portability. The higher-resolution display will be a big deal for people who, like me, prefer touch-typing on the mini’s screen but found its display obviously lacking when compared to the third and fouth-generation iPad. This means that, later in November, you’ll get a device as powerful as the iPad Air, with the same display and CPU, only in a smaller form factor and with a lighter body. That’s an insanely good deal. I don’t buy the idea that the iPad Air is a one-handed device just like the iPad mini. As I noted on last week’s episode of The Prompt, I don’t think that the journalists who tried the iPad Air last week for 10 minutes could form a complete opinion as to whether the Air can be as portable as the mini and, more importantly, if it can be held with one hand for long periods of time. Besides weight, I also think that the smaller screen provides a portrait and landscape iOS experience just as good (for me, even better) as the 9.7-inch iPad. 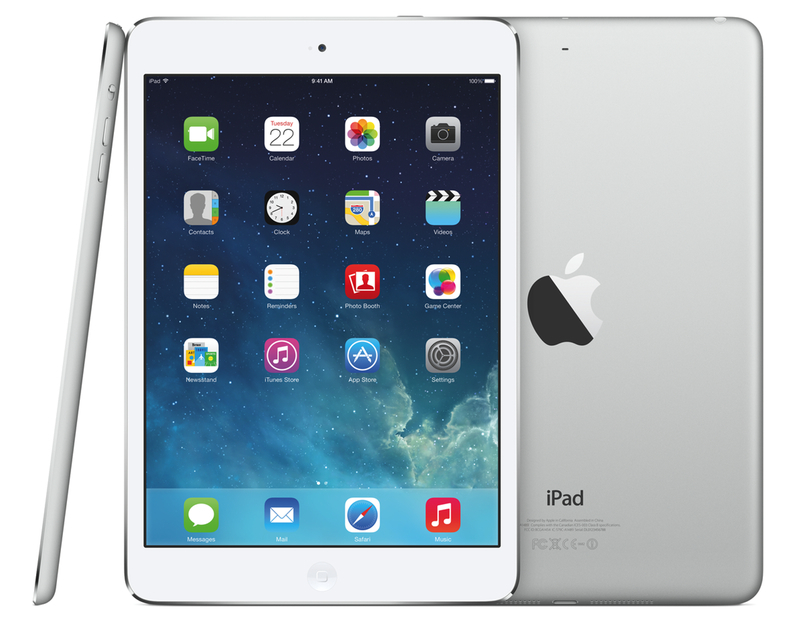 With the iPad Air and new iPad mini, choice doesn’t come down to creation or consumption. It’s much simpler: if you like the larger screen, you get the iPad Air; if you prefer the smaller iPad and saving $100, you get the iPad mini. Don’t let others’ theories convince you: both iPads will be equally powerful and versatile for work and entertainment. Each of them will have its pros and cons, and you should consider how those will relate to how you want to “create” or “consume” content on an iPad. You don’t hear people saying that, because of the size differences, the 13-inch MacBook Air is for consumption and the 15-inch MacBook Pro is for creation. The new iPads should be treated just like MacBooks: choose the size you prefer, and expect creation and consumption capabilities from both. There’s a difference between the new iPads and MacBooks, though: with the iPads, you get the same hardware on both models. This year, Apple won’t have two iPads: they’ll have the same iPad in two sizes.